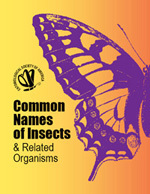 The ESA Common Names database is an essential reference for anyone who works with insects. It includes more than 2,000 common names and is searchable by common name, scientific name, author, order, family, genus, and species. Interested individuals may propose new common names by submitting the Common Names Proposal Form that is reviewed by the Committee on the Common Names of Insects and voted on by the ESA Governing Board. Detailed information on the submission and approval process is available through the links in the sidebar to the right. Our understanding of taxonomy evolves over time, and although the Committee on the Common Names of Insects does work to update the taxonomic information included in the ESA Common Names database, sometimes the committee is not aware of recent changes. If you see outdated taxonomic information in the ESA Common Names list, you can help by notifying the committee at pubs@entsoc.org. Enter a search term in one or more of the filter fields below and click APPLY to see the results.